Although we all love cats there are some common cat behavior problems that the majority of the pet owners have to face. Sometimes these can be easily solved but in other cases the cats may have some medical conditions that determine them to act in a given way. Common Cat Behavior ProblemsCommon Cat Behavior ProblemsIt is usual for the cats to like plants, but sometimes they give them too much attention through chewing them, digging out the soil or peeing in the soil. To take care of the problem you could apply Bitter Orange or Bitter Apple spray on the leaves. As an alternative, put some catnip for the cat to chew on. In case you are thinking about the usual cat behavior problems, you should know that the cat will be jealous if you have a baby. You have to reassure the cat that you still love him. If you don’t have time for him, you can be sure that he will resent you. It is a well-known myth that the cat will be a danger to the baby. If you are interested in the common cat behavior problems you may already know that the cats like the warmth of the babies, but it is highly unlikely that they will sit on the baby’s face. However you should never leave the baby alone with the cat. This is one of the most annoying things that cats can do, but it is also a cat behavior problem that is usual. First you should make sure that the cat doesn’t have any medical conditions. There is a difference between spraying and urinating. The second one is caused by medical conditions. 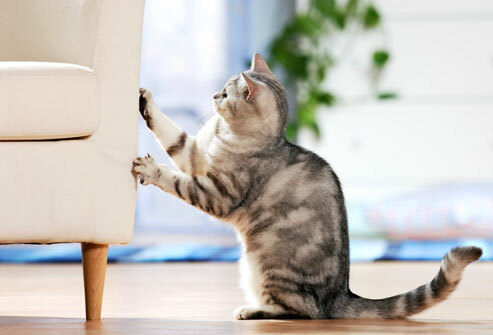 In order to take care of this one of the common cat behavior problems, you should ensure that you remove the odor from the places that the cat urinated before so that he won’t be tempted again. It is important not to use ammonia to get rid of the smell. This is one of the common cat behavior problems. If your cat is stubborn about one place, you should spray it with Bitter Orange or with Bitter Apple that can be found in the majority of the pet stores. Offer the pet a scratch pole as an alternative and reward the cat when he uses the pole.